Samsung is turning the Galaxy S9 and Galaxy S9+ into desktop-like devices with the launch of the DeX Pad. Although this is not the first dock accessory for smartphones that promises an improved user experience, it does boast significant capabilities at a very affordable price point. The DeX Pad allows a Galaxy S8, S9, Note8, and variants of each to be connected to external displays via an HDMI output. Resolutions up to 2560x1440 are supported. There are two USB 2.0 ports for connecting peripherals, while power is handled via USB-C. The only notable lacking feature is an ethernet port, which is found on Samsung's DeX Station. Measuring in at 6.3 x 3.3 x 1.3 inches and weighing in at 4.8 ounces, the DeX Pad is not all that much larger than any of the phones that it supports aside from being significantly thicker to make room for I/O ports. A built-in cooling fan helps keep your phone's thermals in check when running more demanding applications. When connected to an external display, a full Android desktop environment is available with the phone display acting as a trackpad. Support for right-click menus as well as drag and drop commands are easily accessible. Through the use of Virtual Desktop Infrastructure solutions, full Windows machines can be remotely accessed through services such as Amazon WorkSpaces, VMware Horizon, and Citrix Receiver. 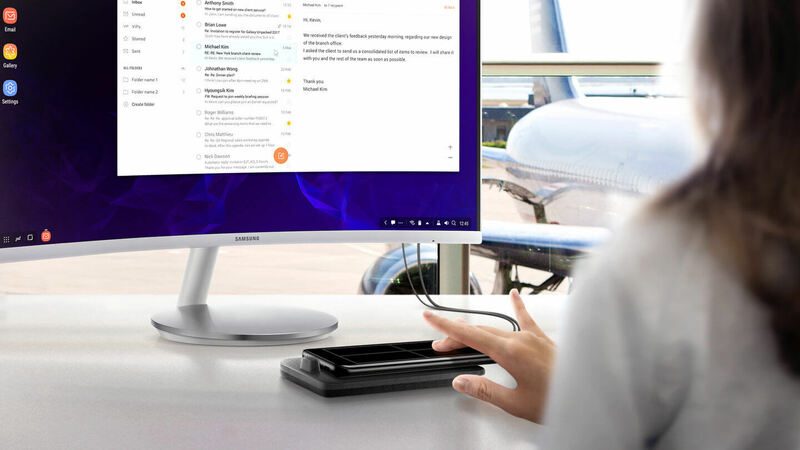 The Samsung DeX Pad is arriving in the United States starting May 13 for $99.99. Consumers are able to pre-order the DeX Pad today directly from Samsung. A free DeX Pad is available for those wishing to purchase a Galaxy S9 or Galaxy S9+ before April 30.